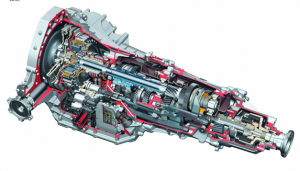 What is an Everett Audi Dual Clutch Transmission? An Everett Audi Dual Clutch Transmission (DCT) system uses two clutches that shift gears automatically, with the assistance of a computer and input from the driver. A DCT is able to shift gears much faster than a clutch operated manual transmission while affording the driver more control than a fully automatic transmission. This superior design combines the best features of manual and automatic transmissions. While a classic (standard) manual transmission offers the driver greater control than an automatic transmission, there are drawbacks to the system. Each time the clutch is engaged, the transmission is disconnected from the engine. When you depress the clutch pedal, there is no power going to the wheels. Additionally, every time you shift, you must remove one hand from the wheel, which may divert focus from other aspects of driving (steering, braking, etc.). A vehicle with an automatic transmission requires neither a clutch nor a shifting mechanism (paddle, gear shift). Although the automatic transmission is much easier to operate, the driver has no direct control of the engine’s power. Automatic transmissions use a torque convertor to transfer power from the engine to the transmission. The fluid coupling of the torque convertor allows slippage and power loss. With a sequential manual transmission (SMT), the driver switches gears, but the clutch is automatic. Gears are selected using a paddle-like mechanism. There is a direct link between the engine and the transmission, like with a standard manual transmission, which supplies power to the wheels of the vehicle. As with standard manual transmissions, when the clutch (albeit automatic in the SMT) is engaged, there is a short time when there is no power being transferred to the wheels. Using paddle shifters or buttons, like SMT, gears are manually selected by the driver. The car’s transmission clutches automatically. As its name implies, there are two clutching mechanisms on a DCT. The two clutches operate in unison, with one handling the odd gears (1, 3, 5) and the second clutch operates the even gears (2, 4, 6). Because of the dual clutches, there is never a loss of power when shifting. From a standstill, first gear is used to start the car’s acceleration using first gear. As you accelerate, second gear is prepared by the second transmission while still in first gear, so that when you upshift, there is an almost immediate response. This sequence of events allows gear change with no power loss. 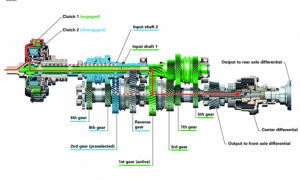 Now in second gear, the first transmission prepares third gear for immediate engagement when you choose to upshift. Gear selection is predicted by an on board computer; calculated using driver inputs (braking, acceleration), enabling the next gear (up or down) ahead of the anticipated shift. The next anticipated gear is always spinning, ready for shifting, producing a seamless shift.